I guess Debbie's story is made up of two main aspects. Firstly as a gaijin wrestling in Japan, and also potential that could never be fulfilled. She was easily the best US women's wrestler during the 90's. There weren't really any stand out gaijins from that decade (from America at least) like Monster Ripper in the 70's/80's or even Awesome Kong more recently, so it was such a tragedy her career got cut short far before her time. She was already an exceptional worker though, carrying the tag team with Sakie Hasegawa (Sakie became an excellent worker around 94-ish). I read somewhere that they were preparing to give her a bigger push. I don't know if that was eventually gonna be for the Red Belt, but she would have probably been a prominent worker into the late 90's and beyond (and possibly with another promotion, considering the AJW exodus). The injury was not long before Dreamslam cards, so imagine what kinds of matches she'd have had on such a stage! If I remember correctly, there was a Debbie imposter that trolled for a time at SC. The story goes that Debbie was trained by the Malenko's and they were very impressed with her. So much that they allowed her to use their last name. I really liked her. She got to commentate for the '92 grand prix, which was pretty cool. I liked her submission style, and she really learned how to work it with the japanese style. LOL, I remember that. It was pretty funny actually. Think a few people bought it. But the real Amazing Kong and Hikaru posted on SC, though. Kong had a well-known feud on the forum with this prick from California who kept on insulting her. We all hated him though! What impressed me about Debbie is how naturally she fitted into the Japanese ring. Too often, American girls have looked really arkward and mismatched, either because they're poor workers, or because they're good but are wrestling a totally different style to the Japanese girls. It'd have been a pretty natural feud if her and Hasegawa never retired, because I could have seen them feuding, seriously. Sakie was another unfortunate case. 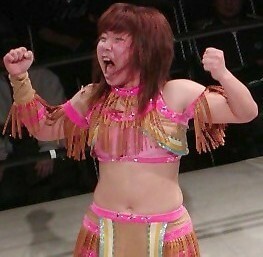 She was *so* close to becoming the next big thing in AJW, but again injury ruined it all. Sad. And since Malenko was so good at the submission style, she'd have been a pretty good fit for ARSION, in its first two years (when they were still faithful to their original style). I really think if not for injury Debbie and Sakie would've ended up 3WA tag champs eventually. The thought of them warring LCO makes my head spin. Trying to recall, did Hikaru ever post much? I remember AK did a decent amount. Hikaru only posted once or twice. AK said it was because of her English not being as well and she was shy about it. I remember that prick. AK totally cut a promo on him too! I also remember getting the details about the AKINO/rugby player incident clarified by her too. I don't know anything about it ! what happened?? ?